I did it. 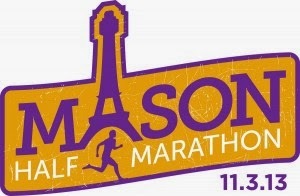 I signed up for the half in Mason on Sunday. I plan on running 4 miles today, tomorrow, and Friday at an easy pace (just to make sure my legs work) and then rest on Saturday before the race on Sunday. Honestly, I am ridiculously excited to get out there and prove to myself that I still have it. All I need is a finish. I can walk some if I need to (I hope I don't need to!) but I just want to cross the finish line. I think I can, I think I can... I think that may be my mantra for the rest of the week. I plan on wearing my Oiselle singlet with arm warmers and my Lesley knickers (also Oiselle). Likely my procompression trainer low in purple. I think that might be my favorite outfit. I know the hubs is buying me some Oiselle for Christmas, which I am excited about (as it is my favorite). He came in to Addie's room the other night when I was getting her ready for bed and said "I am on Oiselle's website. Mediums right?" NICE! It is hard to believe that we are nearing the end of October. I think I need to come up with some new bigger, better goals for November. I think I have been feeling a little lost because I have been setting huge goals and been unable to meet them, or goals that are too small to really track. I am not sure what that means yet. So let me think about it, and hopefully either tomorrow or Friday I will be able to post a nice goal list. It really is going to be tricky I think. I am really not sure what the plan is for the month. I have two more months to meet some goals for the end of the year. We will see if I get there. I am hopeful that they can be accomplished.